Mark Merchant, co-owner of As One Effect has never shied away from a challenge whether it be his workouts or signing up for his next race. 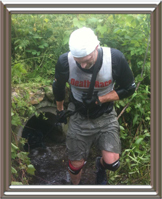 Mark will participate in the “Death Race” sponsored by Peak Races. This race is a 24-hour endurance race that Peak Races lists as “Challenging race that may kill you – 10 miles.” Uh-huh. Sounds like fun. Participants never know exactly what kinds of obstacles they’ll face during the race, but the Peak Races website warns them to prepare for “barbed wire, mud boggin, wood choppin, tunnels, deep water diving, running, crawling, crying, screaming, and sweating. Doubtful you’ll finish but be proud of yourself for trying. 24 hours time limit to finish.” Definitely not for sissies! As co-owner of As 1 Effect, Mark conducts regular high-intensity training sessions for his clients. But his preparation for the Death Race needed something a little different. Enter Sandbag Poker! Take a 100 lb sandbag and draw a card. Perform exercises based on the card’s suit and point value. Face cards mean 11 reps and aces are 15. Flip a card and get started!! !